Following these email signature examples and strategies can lead to more positive responses from your email sends. Having a professional email signature is kind of like dressing for your role or environment. The best in-person pitch in the world doesn’t mean a thing if you show up in baggy shorts and Nike sandals. Using these email signature examples will help you dress the part. Likewise, wearing a 5-piece suit at a networking event wouldn’t get you many prospects either. Much like the world of fashion and dress, we can learn a lot from (good and bad) email signature examples. In this post, we’re going to be a bit like the late Joan Rivers and take a look at the best and worst “dressed” signatures. All in order to improve our appearance when we’re emailing leads, recruiting, or just about any other reason to send cold emails. Our advice is going to be specifically geared toward cold sales outreach. There are wonderful posts for general business signatures. 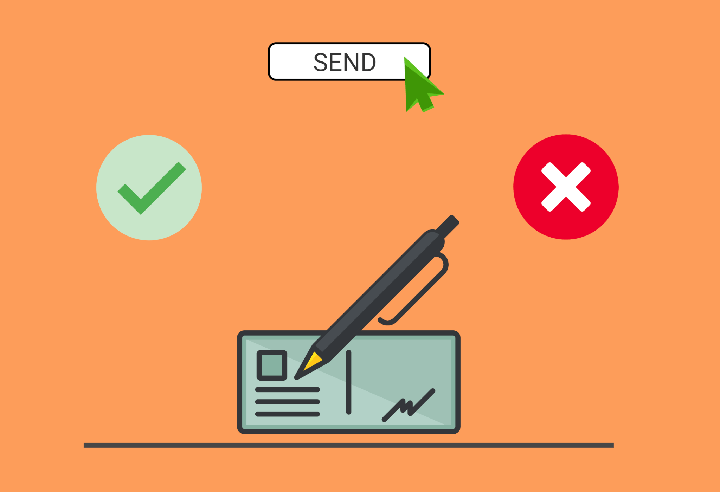 Here’s our take on making your signature help you land more deals. Putting things about yourself into the email sig, like the fashion world, used to be bulky. 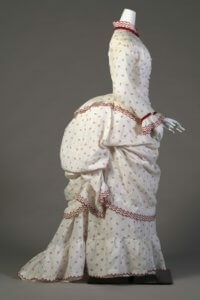 The more fabric you had in the 19th Century—the better. Hey, it was “in” at the time, right? In the email world, it was all about showing everything about yourself that you could possibly fit into the end of the email. We’re not trying to point a finger at someone else. It was what everyone did, including us. Take a look at the screenshot of Justin’s old email signature. Let’s list out the staggering amount of intel in this signature. Yep. 10 individual pieces of information. While the person you’re emailing needs to know about you (and the company you represent)— too much is too much nowadays. A few years ago, this was just as normal as walking down the street wearing the dress above. But cold email and fashion have changed. Standing out with your email signature is all about making a sleek statement. The right amount of data has to be there, but it can’t be overdone. The email you send to cold leads should not be about you and what you offer. It should be about something you have for your leads that they really want. Got a resource that answers questions for that industry? Perfect. Having a webinar that helps businesses get ahead? Great! Offering an opportunity to do a guest post exchange, offer input on a book/resource you’re putting together, or dozens of other “hooks”? All wonderful. The only problem for you is that the email body itself doesn’t leave any room for self-promotion. Meaning, that if you’re going to share anything about yourself, it’s going to have to be in the signature. This gives any cold emailer a decent-sized problem. Every bit of information in your signature could either compete with the call-to-action in your email or help it along. You go trying to get Twitter followers, and there goes your response rate. See what I mean? This is exactly why you have to strip (no fashion pun intended) everything that shouldn’t be there and only include those items required by law and those that behoove your purpose. In 2003, the CAN-SPAM act was signed into law by George W. Bush. The Act has several guidelines that those who use “commercial email” are to follow. According to law, you have to provide your location. And this is likely going in your signature. To be clear; there are other things required to be included in your email. That said, the only thing that usually fits into the signature portion of the email is the address. Unless, you’re inviting recipients to an in-person event, it’s not likely that you’ll want to give an address in the body of your message. Honestly, there are great resources online about what to include and not include in your email signature. And it’s great advice, really. Just Google “Email Signature Examples” and you’ll find many of them. However, it’s not tailored specifically to sales. For instance, most current advice would tell you to include your social profiles as part of the signature. This is still good advice in most scenarios, unless you really want to decrease the number of things to click in your email. So, let’s strip that signature down. A sales email is all about getting response. Which means that you either want recipients to reply to the email or click on the resource/offer you provided. Email Address: This one is agreed upon across the board. Don’t include your email in an email that you send. Site URL: The idea you’re trying to get across is that you really want them to do ONE thing. Not give multiple options. While it may be controversial, we don’t recommend using your URL. Social Profiles: We’ve discussed this one already, but it’s just not the thing you’re going for in a cold sales email. Social Proof: Some signatures include a link to a high profile guest post (like on Entrepreneur.com or something). This is cool for a normal sig, but not the best for a cold sales email. Hopefully, you don’t think that our best email signature examples are just those that include your name and address. 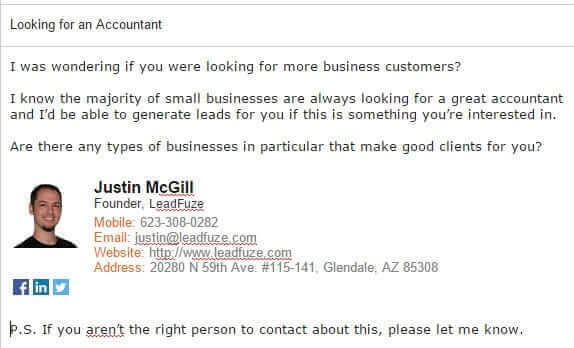 That would look funny and actually harm your chances at getting any kind of response from your leads. Here’s the list of things to include. First and Last Name: Of course, right? But if we didn’t include it, we might have someone try emailing without it. Role: It’s not a bad idea to include your role. It could add validity to what you’re trying to push in the email. Physical Address: Sure, it’s illegal not to, but it’s good to show that you have a business address (either a P.O. Box or otherwise). The real test of whether or not something should go into your email is the distraction factor. Your name, company, role, even address aren’t vying for the attention of your email. If your lead is looking at your signature and sees your Facebook profile, they may say, “Hey, I wonder what he posts on FB?” It’s best to cut that out and let your email do the talking while the “clothes” just back it up. Here’s a signature from Damian (our Chief Customer Officer). It’s stripped down, but still makes a statement. 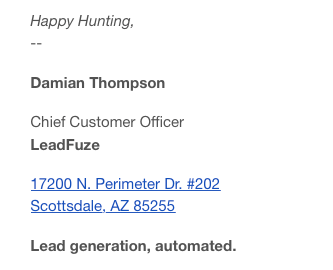 Bonus Tip: You may notice the LeadFuze slogan at the bottom (Lead Generation, Automated). This could be something to test in your emails, but it follows that rule that it shouldn’t take away from your email’s main CTA. The slogan gives a glimpse into you (or your product’s) unique value and begins the process of persuasion in your sales process. There are items that may have a positive or negative impact on things in your email. It all comes down to testing. Photo of Yourself: We don’t recommend it (generally), but in some industries/markets it’s not out of the question. Customer service roles, and others may benefit from seeing a real image. Logo: Having a small version of the logo may help in some instances, but again, we don’t recommend this normally. Phone Number: This one could be a call-to-action in and of itself. An alternative to this is to set up a Calendly link and give your lead an option to set up a call with you. Much less intimidating. What Are Your Email Signature Examples? We’ve shown you a couple of our “real-life” email signature examples to give a good look at how much we’ve changed over the past several years. But what about yours? What kinds of intel have you included in the past? Has anything changed? Are you willing to share some tips, or embarrassing inclusions to help show what’s working and what’s not? Tell us in the comments about your email signature! It’s not a bad idea. It could add validity to what you’re trying to push in the email. Great efforts. I recently came across this free email signature generator tool and find it quite useful. worth trying!